An unforgettable Cooking Holiday in France with a difference. Located in the beautifully historical quaint village of Gramont in the heart of Gascony, South West France. Located in the beautifully historical quaint village of Gramont in the heart of Gascony, South West France, the Gascony Cookery School is a Cooking Holiday in France offering French cooking classes with a difference. 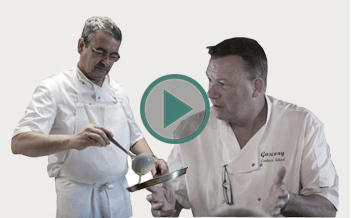 Offering the combined knowledge and experience of two professional chefs of French cuisine, one French and one English, the Gascony Cookery School offers an introduction into French cookery courses that are not only thorough, practical and accessible to all, but also enjoyable. Our style is hands on, not hands off, you will be immersed into our lifestyle and food of the Gascony region that we love and so do our students and guests. Built around the ethos that anyone can cook and that practice is the only way to improve and become better. The Gascony Cookery School believes in a hands-on approach to cookery tuition; this means that from the moment you begin one of our courses in French Cookery until the moment you finish, you are the new chef in our kitchen. We want our students to cook, not sit back and take notes. Finally, our Cookery School is located in the middle of a small, rural French village which means that your journey into French cuisine will take place in a wholly traditional setting. You will be accommodated in a renovated, seventeenth century chambres d’hotes, in which David and his wife Vikki will be your hosts, and your time will be shared between David’s purpose-built teaching kitchen and Bernard’s professional kitchen in his restaurant in the village. Both the chambres d’hôtes and the cookery school are warm, homely environments in which you will instantly feel a part of the family, and a part of the very special village in which The Gascony Cookery School is based.